“Strikeforce: Overeem vs. Werdum” will be jumping off tonight inside the American Airlines Center in Dallas, Texas. The first preliminary bout is scheduled to start at approximately 8PM ET/5PM PT. Make sure to stay with 5thRound.com all night for our live coverage. HDNet will kick off the festivities by airing five live prelim fights. Showtime will broadcast the main card starting at 10PM ET/PT (Tape-delayed if you don’t have access to an east coast feed). 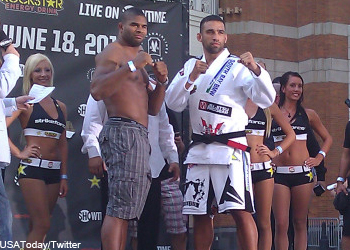 Alistair Overeem faces Fabricio Werdum in the event’s featured attraction. The heavyweights will meet in the opening round of Strikeforce’s tourney. Former UFC champion Josh Barnett will meet Brett Rogers in another quarterfinals matchup.